The French Revolution and the wars of the Napoleonic empire brought about an interruption in the French fishery in Newfoundland. But peace finally arrived in 1815, and in 1816 the French regained the rights that they had previously enjoyed; the situation reverted to what it had been in 1792. The French islands of Saint-Pierre and Miquelon, from which the French had been forced out, were returned to them. 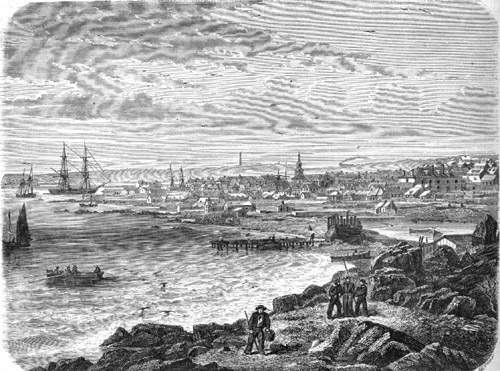 A view of the town of Saint-Pierre, n.d.
From Gobineau Arthur de (Comte), Voyage à Terre-Neuve, Le Tour du Monde, 1863, Vol. 7, 408. As in the past, the French fishery was divided into two parts, the bank fishery, and the sedentary fishery. Ships engaging in the banks fishery left France in the early spring for Saint-Pierre, where they took on provisions, especially of bait, and went to fish on the Grand Banks. Sometimes they returned to Saint-Pierre to unload their catch for drying on shore, take on more supplies, and go fishing again. Less frequently, the fish would be salted on board as soon as it was caught on the Banks. At the end of the fishing season, the catch was taken to France or exported. Ships engaging in the sedentary fishery left France at about the same time and travelled to the coast of Newfoundland, where they anchored for the summer. Fishing was carried on with small boats close to shore, and the catch was dried on shore as soon as it was caught. At the end of the season the fish was loaded on board ships, which then returned to France or was exported elsewhere. The Rue de Paris in Saint-Pierre, n.d. Drawing by Le Breton (from a photograph). From Gobineau Arthur de (Comte), Voyage à Terre-Neuve, Le Tour du Monde, 1863, Vol. 7, 412. While the rights enjoyed by France after 1815 were theoretically the same as in 1792, in fact the situation on shore had changed considerably. Substantial settlement had taken place on the island of Newfoundland, including the area between Cape St. John and Cape Ray where French rights were in effect. The French objected particularly to the growth of west coast communities such as St. Georges and Codroy, and to the spreading of settlers along the northeast coast. Competition between local settlers and the French was to continue for the rest of the century, despite frequent attempts to settle differences through diplomacy. An example was the proposed Convention of 1857 between Britain and France, which would have recognized the existence of a number of English communities along the Treaty Shore (also known as the French Shore) and compensated France for their loss by opening up the coast of Labrador to them. But this proposal was refused by Newfoundland, and was never implemented. Throughout the century the French maintained that the English had no right to fish at all on the Treaty Shore, while the English claimed that they could do so as long as they did not interfere with the French. In many places the French employed English caretakers to look after their premises during their absence in the winter. These caretakers had families, their children began to have families, and so the problem of cohabitation persisted. The French government paid shipowners a subsidy or bounty for taking their crew to Newfoundland; this provided a supply of men trained on board sailing ships who could be recruited into the navy in times of war. 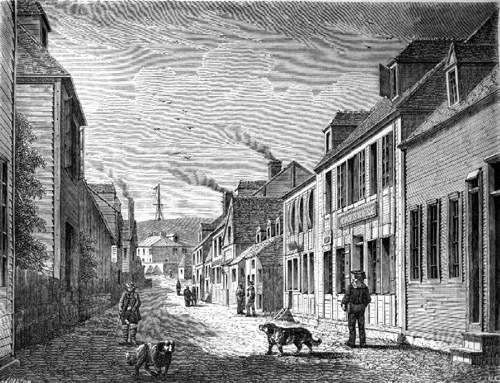 Newfoundland merchants complained that, while the French merchants were their competitors on world markets, Newfoundlanders had no such preferential financial treatment. This continued to be an irritant. At the same time, technology was changing: by the middle of the century naval ships were powered by steam, and the need for having a pool of seamen for sailing ships was fast disappearing. But the French subsidies remained in effect. Later in the century, especially in the 1880s, the lobster fishery became another subject of diplomatic dispute. English settlers or merchants had set up lobster factories for canning the shellfish, and the French vigorously protested. 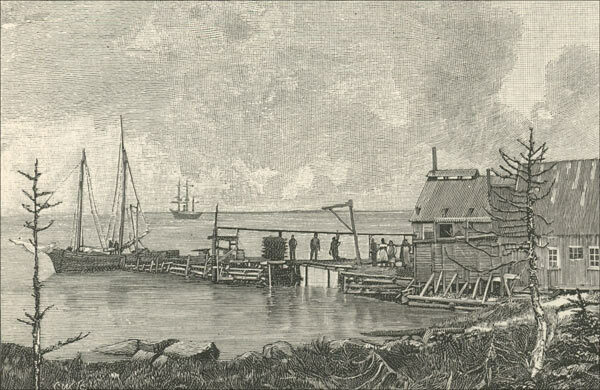 They claimed that these lobster factories interfered with the French cod fishery by taking up prime space along the shoreline and polluting the water with waste. The French therefore set up their own lobster factories, and the English claimed that they had no right to do so, since all they were entitled to do was to catch and dry fish, and that lobster was not a fish. Engraved by C. Weithas, 1891. From Black and White, "The Newfoundland Fisheries Question," May 2, 1891, p. 393. Image reproduced by permission of Kurt Korneski. © 2019. Another irritant was Newfoundland's Bait Act of 1886, which prohibited the export of bait. This was aimed at the sale of bait (fresh caplin or herring) caught in Newfoundland by Newfoundlanders and then sold to French fishing ships. The French had the option of using salt bait that they could bring with them from France, but it was never found to be as effective. But necessity is the mother of invention, and when the supply of caplin or herring was cut off, French fishermen discovered that the whelk, a small shellfish plentiful on the Grand Banks, was another excellent bait, and this they could fish themselves. 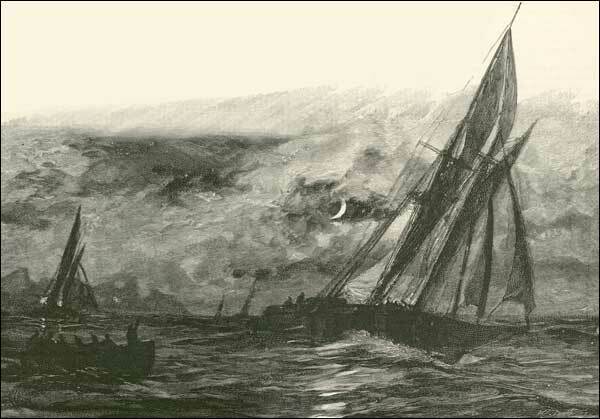 "Fortune Bay Baiters Running the Blockade"
In April 1891 several dozen vessels from mainly Fortune Bay ran (i.e., broke through) the blockade of Newfoundland government vessels enforcing the Bait Act. Drawing by Charlie W. Wyllie, 1892. From Black and White, Vol. 3 No. 59, p. 361 (19 March 1892). Image reproduced by permission of Kurt Korneski. © 2018. Information on running the blockade from Kurt Korneski, "'A Great Want of Loyalty to Themselves': The Franco-Newfoundland Trade, Informal Empire, and Settler Colonialism in the Nineteenth Century" in the Journal of World History, Volume 29, Number 2, June 2018, pp. 145-183. While English settlement on the Treaty Shore continued to grow, the number of French ships involved in the Newfoundland sedentary fishery declined dramatically in the second half of the 19th century. By the 1890s only a handful of ships remained, although the bank fishery was still very active. The situation was ripe for a negotiated final settlement, and in 1904 the various levels of government agreed to the Entente cordiale, under which France gave up all rights to the shores of Newfoundland, while retaining the islands of Saint-Pierre and Miquelon and the right to fish in Newfoundland waters.